Yesterday I posted a review of 500 Pies & Tarts. I was drawn to the book because of my sweet tooth, of course, but the savory ideas here are substantial. Even I cannot deny that. 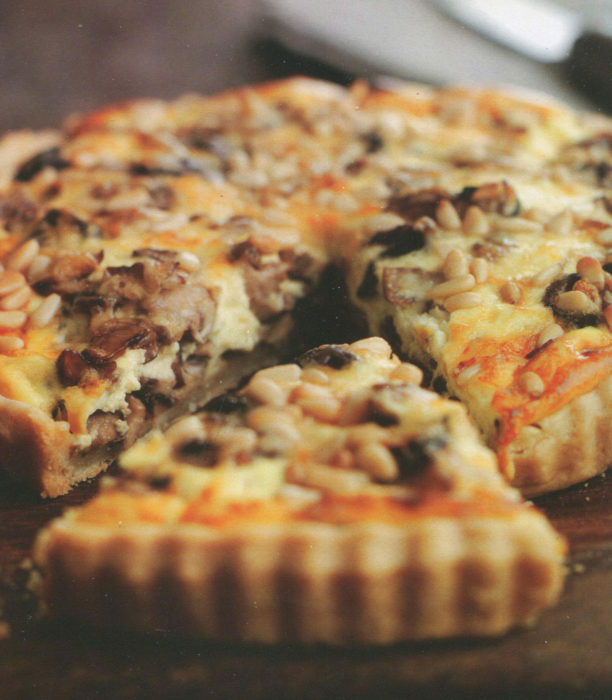 This savory tart combines crust with mushroom, cheese, and pine nuts. You can switch cheeses if you are not a fan of Gruyère. Adding a teaspoon of herbs, say thyme, will expand the flavor dimensions. In short, this is a recipe but also a template for you to play with. This dish is rich and rewarding, a main course that only needs a side salad to make a truly memorable great meal. Oh, some wine. Oh, you might want to look at 500 Pies & Tarts to find a pie, too. Dessert should not be overlooked. This recipe calls for half of a basic pie crust. 500 Pes & Tarts has crusts galore or you can use that one from your mom. Preheat the oven to 400°F (200°C). Roll out the pastry dough and transfer to a 9-inch (23-cm.) tart pan. Bake blind for 15 minutes. Remove from the oven, prick the surface with a fork, and brush the surface with lightly beaten egg. Then bake for 10 minutes more. Transfer to a wire rack to cool. Boil a garlic head in a saucepan filled with water for 15 minutes, then drain. When cool enough to handle, pop the garlic cloves out of their skins and mash in a bowl with the ricotta and creme fraiche until smooth. Season with salt and pepper. Heat the butter and olive oil in a skillet and sauté the mushrooms for 10 to 15 minutes, until they are tender and any liquid has evaporated. Season with salt and pepper. To assemble, spread the ricotta and garlic mixture over the base of the cooled tart shell. Layer half of the mushroom mixture, then half of the grated Gruyère. Repeat the mushroom and Gruyère layers and sprinkle the pine nuts over the cheese. Bake for 25 minutes, or until the filling is hot and the pine nuts are golden brown. Refrigerate any remaining pie for up to 3 days.